Impress your friends with these factoids about the productions of 2018's DCI World Championship finalists! Then, re-live all of those performances from last August which are now available on Blu-ray or digital download. Helping to bring to life the storyline revolving around the four characters inside the diner of Edward Hopper’s famed “Nighthawks” painting, Blue Devils performers had the opportunity over the summer to be inspired by the real-life artwork on display at the Art Institute of Chicago during a day off of rehearsal. Hidden away in nearly every Boston Crusaders production, a seven-note quote from the corps’ signature tune, “Conquest,” can be heard underlying a Morse code-inspired drill formation about a third of the way through the show. Following the “Rite of Spring” storyline, Mandarins’ soloist at the start of the production danced herself to death and later returned to the field, given the gift of life. The aura of glowing rifles accompanied her return. When spun, each rifle appeared as solid shafts of light due to LED lights inserted the length of the equipment. 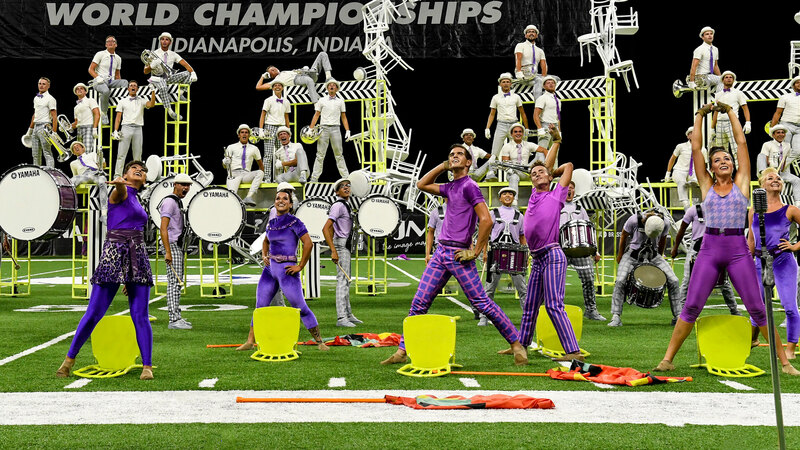 Almost no Crossmen production would be complete without a nod to the corps’ signature Maltese cross. Look for it hidden in plain sight in the final minute as the show ramps up to its exciting conclusion. The Cadets’ theme song, “O Holy Name,” is hidden and weaved throughout the production. The recording of the tune that kicks off the show is of alums and corps members captured earlier in the season in the corps’ hometown of Allentown, Pennsylvania. The Carpenters’ hit, “We’ve Only Just Begun,” served as a Blue Stars musical pun, utilized to kick off the accompanying hammering and sawing of construction. At first, the sawhorses used to set the production’s theme seemed to be just another device to divide up the field, but look close and you’ll see the color guard performers using the props as storage containers to introduce new flags and to hide equipment no longer needed. Throughout The Cavaliers’ production, hard and soft musical and visual elements coexisted simultaneously, highlighting the thin line between madness and creativity. Snippets of the corps’ theme song, “Over the Rainbow,” were first snuck into the front ensemble percussion music and later passed to the horn line, easy to miss due to a sudden visual explosion of color. While Carolina Crown’s “Beast” was often wild and unpredictable, it also had a softer, more vulnerable side as part of the ballad, “If I Fell.” Members of the trumpet and mellophone sections got to trade in the treble clefs on their sheet music for bass clefs during this segment, joining the baritone horn players to create a 44-member trombone section, one of the biggest ever fielded by a DCI corps. The obelisk on the back sideline of the field represented Ra, the Egyptian deity of the sun. Ra fought off evil at night so his worshippers could be productive during the daylight hours. Deeper down, however, the show focused on the ability of the human spirit to overcome adversity and come out of periods of darkness feeling inspired and reborn. The featured singer in Bluecoat’s 2019 production originally auditioned for a mellophone position and stayed on that instrument through the corps’ January rehearsal camp. None of her fellow corps members had any idea she was going to be a featured singer until the production began to take more shape. Although Regiment performed parts of Dvořák’s music, this wasn’t a “New World Symphony” show. Rather, the music became more of an accompaniment to something akin to a movie, exploring how people might respond to the stimuli of suddenly being deposited somewhere they haven’t been before.